KEMPINSKI Hotel Ajman has reopened its famous beachfront restaurant Zanzibar which sits on the pristine stretch of private beach, exclusive to hotel guests. By day, the breeze and the gentle waves lapping nearby provide the perfect soundtrack and a spectacular beach view. What awaits diners is a casual dining experience where you can choose from an extensive a-la-carte menu, loaded with seafood options including the fresh catch of the day. The beverage menu features signature cocktails and delicious refreshing drinks adding to the relaxing experience by the beach. By night, Zanzibar transforms into one of the most romantic settings in Ajman – facing the sunset and overseeing the dim lights of fishing boats appearing on the horizon. A romantic setup can be prepared on request, check for tailor-made private dining packages. 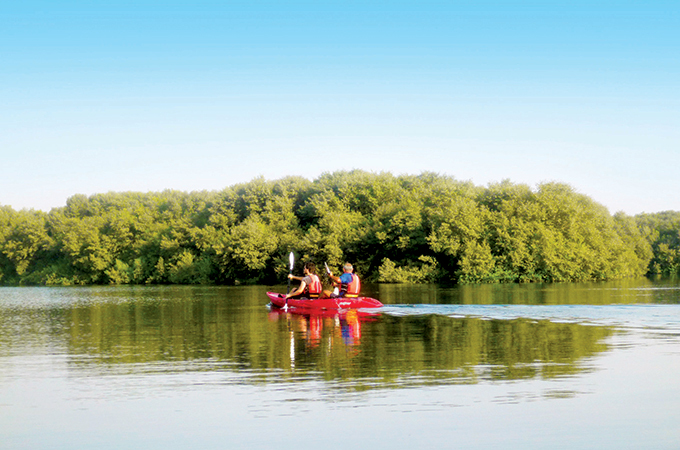 AL ZORAH, the 5.4 sq m luxury and lifestyle destination on the natural peninsula of Ajman, is ramping up the tourism appeal of the destination with the launch of kayak tours through its natural mangroves and lagoons soon. The exclusive tours will offer visitors a chance to enjoy the region’s prized natural mangroves, officially declared as a Wetland of International Importance by the Ramsar Convention. Spanning an area of over 1 million sq m, the thick, natural mangroves of Al Zorah is home to over 102 species of native and migratory birds including the famed pink flamingoes that can be spotted throughout the year and more so during the nesting season. The area is abundant with a variety of corals, fish, molluscs and indigenous flora. LE BRISTOL HOTEL, with more than 65 years of bringing luxury to its guests from all corners of the world, is an icon of Beirut. In a new partnership with Preferred Hotels & Resorts, the landmark hotel is now part of the global membership of exclusive hotels and part of the exclusive Preferred Hotels & Resorts LVX collection. Through its five global collections, Legend, LVX, Lifestyle, Connect and Preferred Residences, Preferred Hotels & Resorts connects discerning travellers to the singular luxury hospitality experience that meets lifestyle choices and preferences in each location. With the new partnership in place, Le Bristol will be able to extend the benefits of iPrefer rewards programme to its partners to guests. iPrefer points may be redeemed for cash-value reward certificates, elite status and special privileges such as complimentary internet and more. THE Carlson Rezidor Hotel Group has added two Radisson Blu hotels in Buraidah and Jeddah, adding to the upscale properties offering in these cities. The Radisson Blu Hotel, Buraidah has 110 spacious guest rooms and 12 stylish villas. The guest rooms provide comfortable and spacious accommodation while the villas are ideal for families visiting Buraidah or long-stay business travellers. Buraidah is an important production centre for date, cereal and citrus industries, the hotel is easily accessible from the Northern Ring Road and overlooks the city centre, which is a mere 5km away. It enjoys a prime location near to Al Qassim industrial city and 25km from the regional Prince Naif International Airport, which offers flights to both domestic and international destinations. The Radisson Blu Hotel, Jeddah Al Salam is Carlson Rezidor’s fourth hotel in Jeddah, Saudi Arabia’s second largest city. It is located close to many of the city’s popular shopping destinations, cultural attractions and sports venues and is a short distance from King Abdul Aziz International Airport. The nearby Corniche offers spectacular views of the Red Sea coastline. In Jeddah, Radisson Blu has 142 contemporary rooms and suites, all with a cosy, modern interior. The hotel features ten meeting rooms and two ballrooms covering more than 1300 sq m, and a flexible space that can accommodate up to 800. All meeting rooms are equipped with the latest conference technology and individual climate control.